Featuring the legendary Coach Dianna Williams and her team of Dancing Dolls, comes the unforgettable, jam-packed heart-pounding experience we call Bring It! Live. 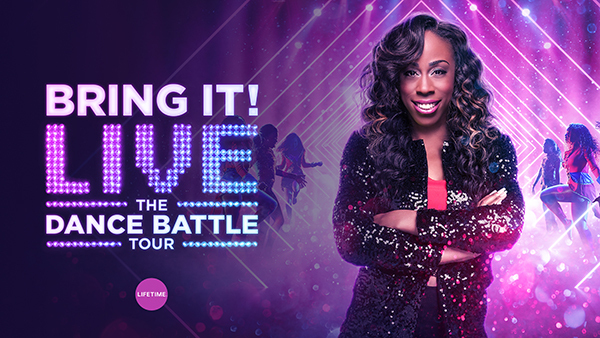 After three acclaimed touring seasons, the hit Lifetime® TV series Bring It! is live on-stage in Knoxville for the first time ever! With never before seen routines and an all new fan vs Dancing Doll stand battles, Bring It! Live is coming to the Knoxville Civic Auditorium on Sunday, July 21, 2019 at 7PM. The 2019 summer tour will feature an all-new interactive show with hotter-than-ever performances inspiring fans of all ages in an evening packed with motivation, inspiration and formation. VIP packages are available at all price levels. The deluxe VIP package includes premium seating, a souvenir tour program and photo opportunity. The add-on VIP package includes a souvenir tour program and photo opportunity and can only be purchased if accompanied by a valid ticket to the live performance. Limited supplies are available. Bring It! returns with all new episodes on Lifetime® beginning Thursday, January 17th at 9pm ET/PT or anytime on mylifetime.com. As the brand-new dance season begins, Coach D has decided to break her biggest rule and the change shakes the Dollhouse to its core. For the first time EVER - BOYS will be dancing alongside the team and this new addition creates chaos. With new team captains and a new assistant coach, the boys and girls will have to learn to work together to keep their heads in the battle if they want to be number one. Tickets (starting at $32.75 plus service fees) are available at ticketmaster.com, by phone at 800-745-3000, and at the Knoxville Civic Auditorium Box Office.